AGREUS, NOMIOS and PHORBAS were a trio of Panes--goat-legged daimones of the mountain wilds. They presided over hunting, herding and grazing respectively. Agreus "Hunter", Nomios "Of the Pastures" and Phorbas "Of the Grazing" or "Frightener" were really just three aspects of the primal god Pan. 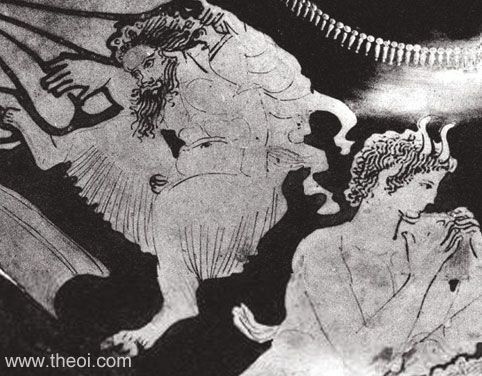 Pan Nomios, the son of Hermes and Penelope, was the god's most familiar form. The first two names were also titles of the rustic god Aristaios (Aristaeus) of northern Greece. "[Rheia summons rustic-spirits to the army of Dionysos for a campaign against the Indians :] The rockdwellers came also from their self-vaulted caves, bearing all the name of Pan . . . all armed to join the host; they have human form, and a shaggy goat's head upon it with horns. Twelve horned Panes there were, with this changeling shape and hornbearing head, who were begotten of the one ancestral Pan their mountainranging father . . .
With these were two other Panes, the sons of Hermes, who divided his love between two Nymphai (Nymphs); for one he visited the bed of Sose, the highland prophetess, and begat a son inspired with the divine voice of prophecy, Agreus, well versed in the beast-slaying sport of the hunt; the other was Nomios, whom the pasturing sheep loved well, one practised in the shepherd's pipe, for whom Hermes sought the bed of Penelope the country Nymphe. Along with these came Phorbas (Fear) to join their march, savage and insatiate." "[The Indian river Hydaspes tried to drown the army of Dionysos :] Hermes Longwing caught up and held his own child, the son of Penelope, hornstrong hairy Pan."